WASHINGTON — After a weeklong NAFTA negotiating round in Washington, the lead political ministers are heading home. They will reconvene around May 7. 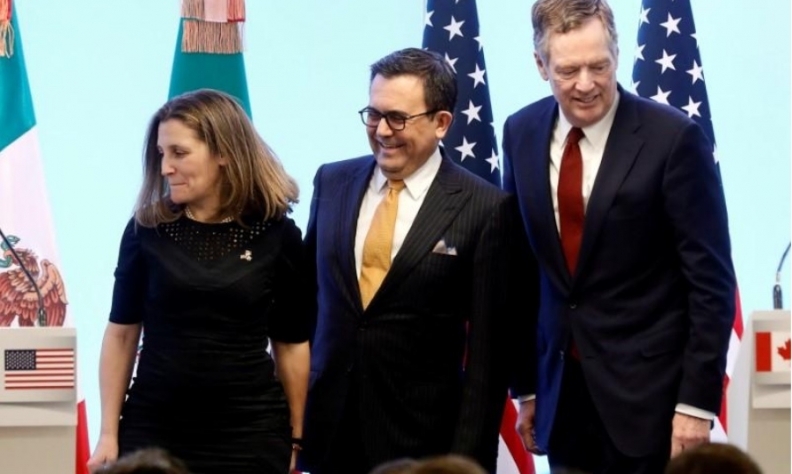 Canada's Foreign Affairs Minister Chrystia Freeland and Mexico's Economy Minister Ildefonso Guajardo will leave the U.S. capital, while their American counterpart, trade czar Robert Lighthizer, shifts his focus next week to a highly anticipated trip to China. In the meantime, civil servants will continue to work on the technical details surrounding a new NAFTA, after having been in Washington for two weeks, and working through the last weekend. "If you know a Canadian trade negotiator, please give them a hug. Because they are working 24/7, people are cancelling holidays, people are working weekends," Freeland said. "At the political level ... we will be going home to consult on the significant progress we've made this week. Then we will be meeting again in a week or so in Washington." Freeland said there was good progress this week on autos, which she calls the key issue of the talks. She also said stakeholders in the auto industry will now be consulted as the process drags on. A number of other chapters are on the verge of conclusion, said Guajardo, who specifically mentioned state-owned enterprises, technical barriers to trade, financial services and the environment. But numerous irritants remain, leaving uncertainty about what happens next, with U.S. steel and aluminum tariffs set to kick in next week and the deadline fast approaching to get a deal that can be voted on by the current U.S. Congress. America's neighbours reject the idea of linking the tariffs to the negotiations as a pressure tactic. "Entirely separate [issue],’’ Freeland said. "There is no justification whatsoever for tariffs or quotas on Canadian steel or aluminum as a national security consideration. We continue to hold that position."